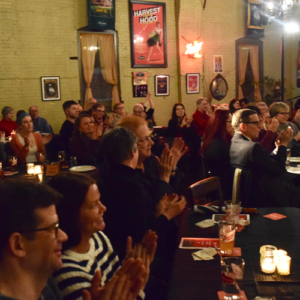 Join us for A Play, A Pie, and A Pint’s 2018/19 Season! PPP’s 2018/19 Season features two world premieres, some of Philadelphia’s favorite performers, and a one-night only Valentine’s Day celebration. Every ticket comes with the show, a slice of pizza, and a beer or soft drink. Enjoy brilliantly casual theater with Tiny Dynamite! Poor Marcel: he just wanted to enjoy a leisurely soak. But what are all of us doing in his washroom? What will he do about it? And why is he working himself up into such a lather? Charlie DelMarcelle delights in this exuberant world premiere comedy starring Marcel, his wife, and all of you. As the soapy snoopers, you can talk back to Marcel, or just enjoy watching him get steamed. He might not be pleased that his bath time has turned into show time, but the audience gets the last laugh. Looking for an extra cheesy night out to celebrate Valentine’s Day? Join A Play, A Pie, and A Pint for a one-night only event. We’re brewing up an evening of fun, whether you’re single, coupled up, or it’s complicated! 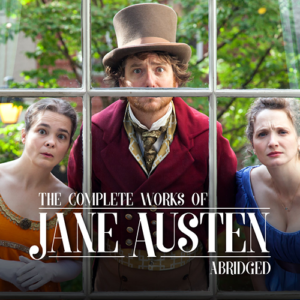 Come along for a fun, funny, and fast-paced romp through the masterpieces of Jane Austen with the world premiere of The Complete Works of Jane Austen, Abridged. Three nimble actors take on all of Austen’s beloved heroines, friends, and love interests—and her incisive social satire—in just one hour. Share a slice and fall in love with Emma, Elinor, Mr. Darcy, and more, as brought to life by some of Philadelphia’s favorite performers. It is a truth universally acknowledged that an audience in possession of high spirits must be in want of a ticket to this big-hearted comedy that will delight Janeites and newcomers alike.